Scott Coupland scored five goals. Deeping Rangers were on cloud nine last night (November 9) after making it 11 games unbeaten in the ChromaSport & Trophies United Counties League. They moved up to fourth in the Premier Division table with a 9-1 romp at Huntingdon. Scott Coupland scored five for Rangers with David Burton-Jones, Scott Mooney, Dan Schiavi and Will Bird also on target. Jordan Brockett was the home scorer. 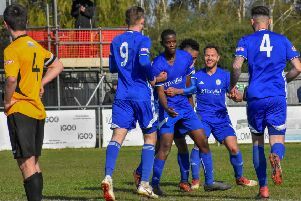 Stamford were back in Northern Premier League First Division South action last night after their incredible FA Cup run was ended at League Two Hartlepool on Sunday. They were at home to Loughborough Dynamo and picked up three welcome points with a 2-0 win. Both the goals came in the first half with Chris Salt firing the first on 33 minutes and Taylor Rhiney the second in the 45th minute.